This, it seems, is the very first commercial recording from the Comoro archipelago in the Indian Ocean; or, at least the first in a Comorian language. It has never been reissued or discussed, as far as I know. In earlier entries, I’ve mentioned the race to record musicians in East Africa by European record companies that began in 1928 and was halted after 1930. Of course, records and gramophone players had already been present in the region likely for two decades or so, but these early sessions marked the first attempts to record “popular” music of the region and to solidify an East African market. The Gramophone Company recorded three sessions that featured Zanzibari musicians (in 1928, 1929, and 1930, respectively), most notably Siti binti Saad and her group. In all three sessions, the musicians were sent to Mumbai to record. 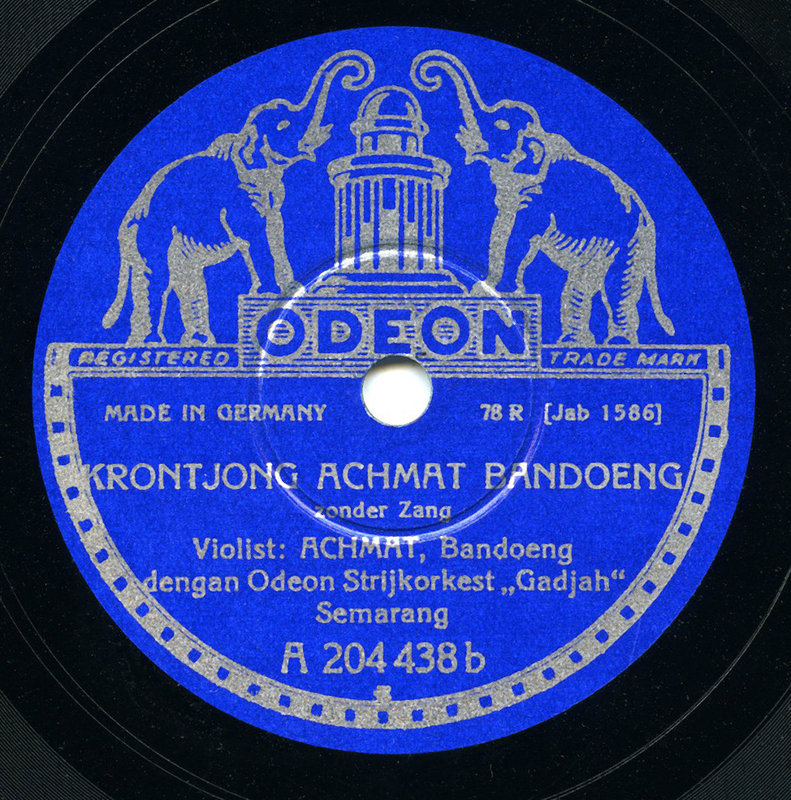 In 1930, Odeon recorded on site in Mombasa and then a little in Kampala, Uganda. That same year, Pathé sent musicians by boat to Marseille and then on to Paris to record. And from February to April of 1930, Columbia had a team recording in Zanzibar and Dar Es Salaam. This record is from those Columbia sessions in Zanzibar – issued on their “Tanganyika & Zanzibar” series, which had one of the most beautiful early label designs in history. Of all the musical forms in the region, the remarkable taarab, sung in Swahili and played largely in coastal areas, was by far the prevailing style preferred by the record companies. They recorded it almost exclusively in Zanzibar and Mombasa, in part due to the runaway success of the 28 records from Siti binti Saad’s first session, which was entirely taarab music. Deeply influenced by the music of Egypt, the Arabian Peninsula, and South Asia, taarab has its origins in Zanzibar in the late 19th century. The cloudy story is that the sultan, Barghash bin Said, invited a musical ensemble from Egypt to play and teach his musicians. From there, this secular style of music with poetic lyrics spread to the mainland, even as far as Uganda and Burundi. It also took root in Comoros, and was played in the Comorian community in Unguja (Zanzibar island). The Comoros, located some 480 miles south-southeast of Zanzibar off the coast of northern Mozambique, were also an important trading spot for centuries between coastal Africa, Southeast Asia, and the Persian Gulf. The French officially colonized the islands in the mid-19th century, and as with with Réunion, they created a plantation-based economy. When this recording was made in 1930, the Comoros were part of the colony of Madagascar; however, culturally there had always been a deep connection to the Swahili coast. Comoros has its own brand of taarab, known as twarab. According to scholar Werner Graebner, taarab was introduced from Zanzibar to the main island of Ngazidja (also known as Grand Comore) at some point prior to 1912/1913, and perhaps as early as 1908, when the first musical association was established on the island. The center of musical activity was the main port of Moroni. By the late 1920s, there were several twarab groups on the island. But, they were never recorded. 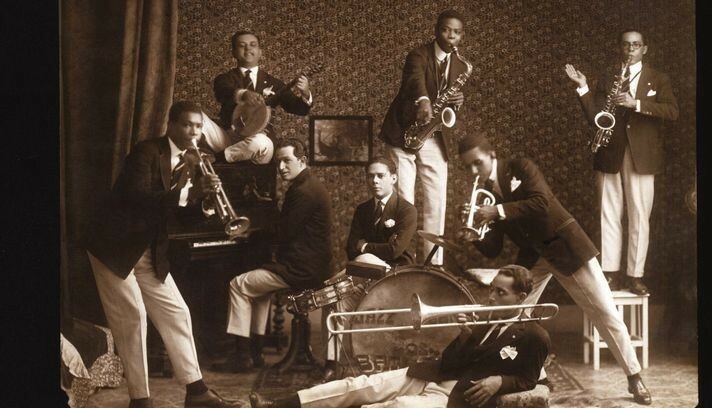 When Columbia Records of England came to Zanzibar in 1930, they, like the others, recorded the stripped-down style of taarab that was popular at the time, featuring mainly oud (or sometimes the gambus), violin, percussion, and vocals. The Zanzibari artists were by then well-known and credited by their full names: Budda bin Mwendo, Subeit bin Ambar, Malim Shaban, Abeid bin Mohamed. But, there were two discs recorded by a mysterious artist known only as “Abubakar.” His discs were listed as being in the “Kingazija” language, now known more commonly as Ngazidja, the language of the Comorian island of the same name. It’s not known if he was from Comoros or from the Comorian community in Zanzibar, or if he was in fact a Zanzibari who spoke the dialect. The fact that he was credited only by a single name, without “Sheikh” or “Effendi” as some of the other musicians were, may indicate that he was not a member of the elite class of Zanzibari musicians. I’ve included both sides of this piece. It sounds like he is accompanied by an oud (though perhaps a gambus as it’s credited as “native instrument” instead of “ud” or “oud”), along with violin and percussion. Much info gleaned from Janet Topp Fargion’s and Werner Graebner’s writing. Hello, hello – it’s been a while. The collecting hasn’t stopped and has continued apace, but I’ve been concentrating on some upcoming releases which I hope can see the light of day soon. That, coupled with a reticence to repeat myself endlessly across numerous posts, created a little delay. But, we are back. This one is still hot from the hands of the postal service. Maybe it’s still fresh to me. It’s back to the music of Madagascar after many years, for a style that barely made it to disc during the 78rpm era: accordion-based dance music. 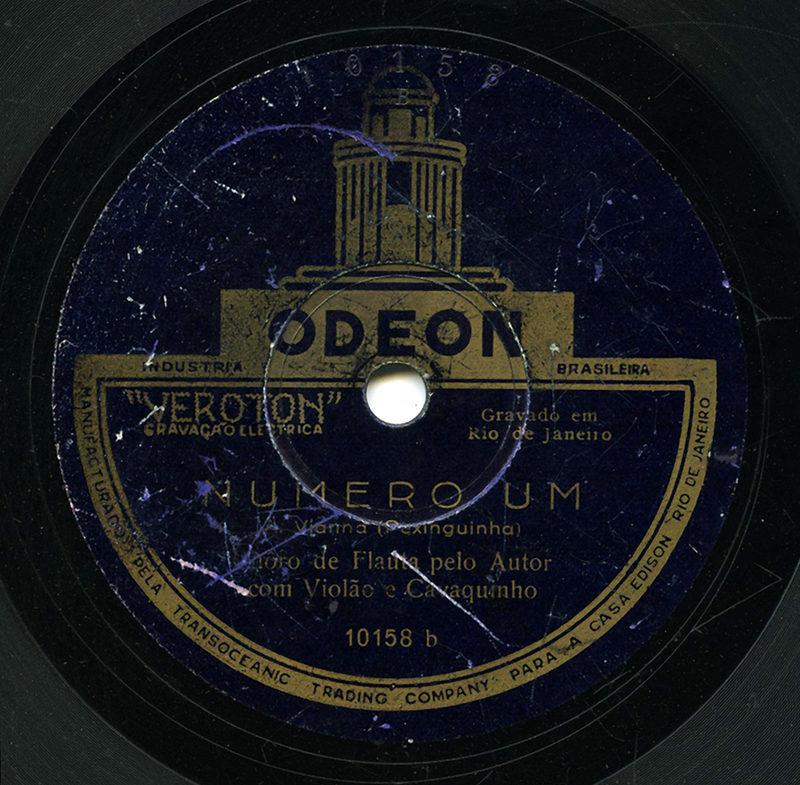 The first substantial, commercial recordings of Malagasy music were made by the French divisions of the Columbia and Odeon labels, on site, in 1930. The Columbia session resulted in over 160 records. Primarily, Columbia featured groups accompanied by piano or harmonium, often examples of Malagasy operetta known as kalon’ny fahiny. There were also some performances with the classic valiha tube zither, mandolin, guitar, and sodina, the local flute. These records weren’t just for locals in Madagascar – they were also for the French who might be interested in “exotic” music of the colonies. “[In Madagascar] reigns a delightful atmosphere of musical fragrances, songs with languid and fresh melodies; all a sensuous and endearing poetry,” claimed the Columbia catalog that advertised those discs, which also deliberately noted how essential it is to the listening experience that the Malagasy music they recorded was substantially influenced by its connection to Europe. It could be that this was the reason for the inclusion of all the piano/harmonium music – however, kalon’ny fahiny music was extremely popular in Madagascar at that time. While many examples had an “uptown” operatic feel to it, much of it is inescapably in keeping with the melodies of Malagasy folk music, and the incredible nasal, vibrating soprano vocals. It’s unclear if Odeon was recording at the same time, immediately before, or immediately after Columbia. They, too, issued a generous 125 records, at least. And again, their session yielded a large amount of music by elite theatrical troupes accompanied by piano (though violin, guitar, mandolin, and accordion performers also were recorded), their bandleaders finely coiffed and dressed in suits in their catalog. Odeon’s exclusive representative on the island was a massive distribution company founded in Réunion at the turn of the 20th century, Cie Marseillaise de Madagascar, but again, these discs were also distributed in France to intrigued locals. However, as historian Paul Vernon has pointed out, the initial pressing for these discs in this nascent market was scant: about 50-100 copies each. While they appear to have been occasionally re-pressed, virtually all of them are rare. Today, if anyone at all is familiar with early Malagasy music, it’s due to an incredible selection of recordings made in 1931 in Paris, during the massive, years-in-the-making Paris Colonial Exposition, where Malagasy musicians (among many others) traveled to perform, staying for months. Most all of these discs have been compiled on influential and highly recommended CDs, namely The Music of Madagascar on Yazoo, and Madagascar: Musiques de la côte et des hauts plateaux on Fremeaux. They prominently featured stunning choirs accompanied by the valiha, whereas most all the several hundred Odeons and Columbias that had been released just prior, did not. The performances with valiha (pronounced “valee”), the tube zither that, when played, sounds like rain on a quiet lake, could have been out of fashion by 1931, perhaps increasing their importance in hindsight. During the Exposition, the French office of HMV issued twelve records’ worth of songs by the visiting musicians; Polydor also issued twelve discs, and Pathé issued seven. Some of the same tracks appear to have been recorded by both companies. Some of the Pathé/Polydor discs were re-pressed in limited amounts by the Musée de l’Homme in Paris, and some of the Polydor tracks were re-pressed after World War II, after the Philips label had the rights to the French Polydor/Polyphon material. As beautiful as these recordings are, one style that was not featured was accordion-driven music for dance, a style that crops up regularly on more contemporary ethnographic LPs and CDs from Madagascar. A few 78s managed to squeak out, however. I reissued a side from the obscure Colombe label on Opika Pende, one of a cluster of at least three discs of field recordings featuring accordion shunted between piano and operatic releases, issued in the early 50s. And this piece, from the Discomad label, ca. 1959-60. While the performer’s name might make this look like an ethnographic recording, it’s not – the name of band/group performing here is actually “Association Folklorique de la Côte Est,” and its musical directors were François Leboto and Patrice Petera. It’s a song of the Betsimisaraka, the second largest ethnic group in Madagascar who are generally concentrated along the east coast. “Betsimisaraka” has been translated to “The Many Who Will Not Be Sundered,” “The Many Inseparables,” and perhaps the most contemporary-sounding, “Those Who Are Many and United,” the name stemming from the early 18th century when several local clans were joined. I’m not sure if this is basesa music of the Betsimisaraka, which is a kind of ceremonial dance music with accordion that is played during tromba. Tromba is a loose term for rituals having to do with spirit possession, but that can feature dancing, music, and celebrating. Either way, it’s rare to find performances this alive, with shouts and hollers, and not have them be ethnographic and instead commercial releases. This and the Colombe discs are the only 78s I know that feature this style of music. The label Discomad was founded in Antananarivo ca. 1959-60 by a man named Raoul de Comarmond (1908-1993). Born in Mauritius, Comarmond started working with record companies in Madagascar as early as 1937 when he helped to organize a Polydor recording session. By the early 1950s, he was recording for the French branch of Decca, his discs branded with “R. de Comarmond” on them. His business, Comarmond et Cie, a distribution company, was located on Avenue de l’Independence (then “Avenue de 18 Juin”). He founded a pressing plant to produce his new discs in 1960, as well as Discomad’s sister labels, Decco and Decophone. All told, he issued approximately 350 78s, certainly the the most successful Malagasy label outside of the major European concerns. Discomad was issuing 45s by 1962, though I am unsure what the crossover was between formats. For example, the Association Folklorique de la Côte Est issued at least two 45rpm EPs on Discomad, yet this piece does not appear on either. It could be this was its only issue. In any case, Discomad continued for decades, run by Comarmond’s son, Jean-François, and then his grandson, Stephane. Thanks to Thomas Henry and the works of Paul Vernon! Ever since I heard Mongolian music for the first time, I felt very drawn to its power. So, I decided to pack my backpack and visit Ulaanbaatar in the hopes of finding traces of early recording. My adventurousness was rewarded. This record I obtained from the estate of a Hungarian politician is no longer an obscure treasure of Mongolian music. It was Mr. Surenkhorloo, a scholar of early recordings, whom I luckily met in Mongolia, and who kindly helped me to shed some light on the story behind this very disc. It features the fine songstress Dashzevegiin Ichinkhorloo (1910-1972) performing three short pieces. The first is titled “Gan Tumur,” where she is accompanied by Mr. Dorjdagva on the bowed instrument known as the khuuchir. Both were honored People’s Artists. 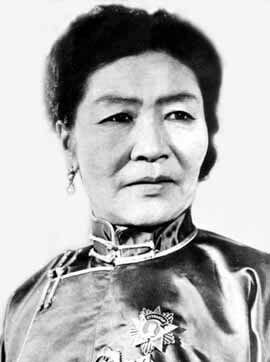 The second track is a well-known folk tune titled “Gandii Mod” (mynah tree), and the third is “Yanjuur Tamkhi.” In the latter, she is accompanied by another People’s Artist, Magsarjavyn Dugarjav (1893-1946), on the Mongolian flute, the limbe. These three recordings were made in Moscow in 1934 and first released on the state-run label known as Gramplasttrest, numbers 427/428. I was told that in the early days, records were not common in Mongolia at all. They rather were awards for gifted musicians. Therefore, these issues are very scarce. The copy featured here is a reissue on the BNMAU label (Bügd Nairamdakh Mongol Ard Uls – or, Mongolian People’s Republic). In 1946, BNMAU released several records for Mongolia’s 25th anniversary of independence from China. They were pressed in the Soviet Union. If you happen to be in Ulaanbaatar, make sure you visit the “Mongolian Theatre Museum” near Sukhbaatar Square. It features an awesome music section. They even have Mrs. Ichinkhorloo’s shanz, her diary, and numerous pictures on display. Meanwhile, you can listen to her singing. *While Europeana states that the instrument is the morin khuur, we believe that it is in fact the khuuchir, though the limits of recording could alter the sound, and it could in fact be the morin khuur fiddle. Secondly, Europeana also lists the date of the recording as 1938 – we believe that is incorrect, and that their recording is in fact Haslund Christensen’s 1938 re-recording or dub, at an inaccurate speed, of the very same 1934 Soviet recording of “Gan Tumur” that was eventually issued on BNMAU, here. I reached out to Excavated Shellac followers on Facebook, asking for suggestions in an attempt to give myself a much-needed kick to complete a new post. One of the primary requests was string music from Iran. I decided for something in the ballpark, geographically and musically, though slightly more complicated. The artist featured here, Bala Melikyan, was an Armenian from Nagorno-Karabakh, the currently autonomous, disputed territory inside present-day Azerbaijan. Mountainous Karabakh has been a region with ethnic strife between the majority Armenians, who refer to it by the ancient name of Artsakh and are allied with Armenia, and the Azeris. The conflict dates back well over 100 years, rooted in the Bolshevik takeover of what was then known as Transcaucasia, and is something I will freely admit to being only a novice at grasping. What I can say, however, is that when it came to recording music in the Caucuasus prior to the Russian Revolution, the region was ethnically complex. Whenever a recording engineer went to Tbilisi in Georgia (considered the cultural center of the Caucasus at the time), or Baku in Azerbaijan, multiple ethnicities were recorded, and often the musicians played with each other, regardless of ethnicity. Singers commonly performed in multiple languages. This, on its own, naturally suggests deep musical ties all across the Caucasus, and of course, Iran. Such is the case with Bala Melikyan. Born in 1888, Melikyan was a Christian Armenian from Shusha in Karabakh, a city known for its musicians who practiced the Azeri musical form known as mugham, and one of the primary cities for Armenians in the Caucasus, along with Tbilisi. His instrument was the tar, the long-necked lute of the region with a resonator that is “waisted” with an hourglass shape, traditionally is made of mulberry wood, and with three sets of double strings. Melikyan was the son of a famous tar player from Shusha known simply as Grigor (1859-1929). I’ve documented Grigor as having recorded for the Gramophone Company in at least two sessions in Tbilisi, under the names Balitka Grigor (1909) and Bala Grigorevich (1910), respectively. Prior to the Russian Revolution (as discussed in this earlier post), the recording industry in the region was for the most part run by Europe-based multinational corporations. Even smaller labels, liked Extraphone in Kiev, who recorded in Baku, were sub-branches of European companies. After the onset of World War I and the Russian Revolution, there was a dramatic slowdown if not a full shutdown. Recording in the Caucasus and many other places under Soviet control essentially ceased after 1915 (and the 1915 sessions made by the Gramophone Company were completely lost). The industry began to pick itself up throughout the 1920s – but this time, it was governed by the State. According to Anzor Erkomaishvili, after the Revolution there was no recording in the Caucasus until 1930*. This is one of the first – a tar improvisation by Melikyan in the Azeri mugham repertoire, in the segah mode. 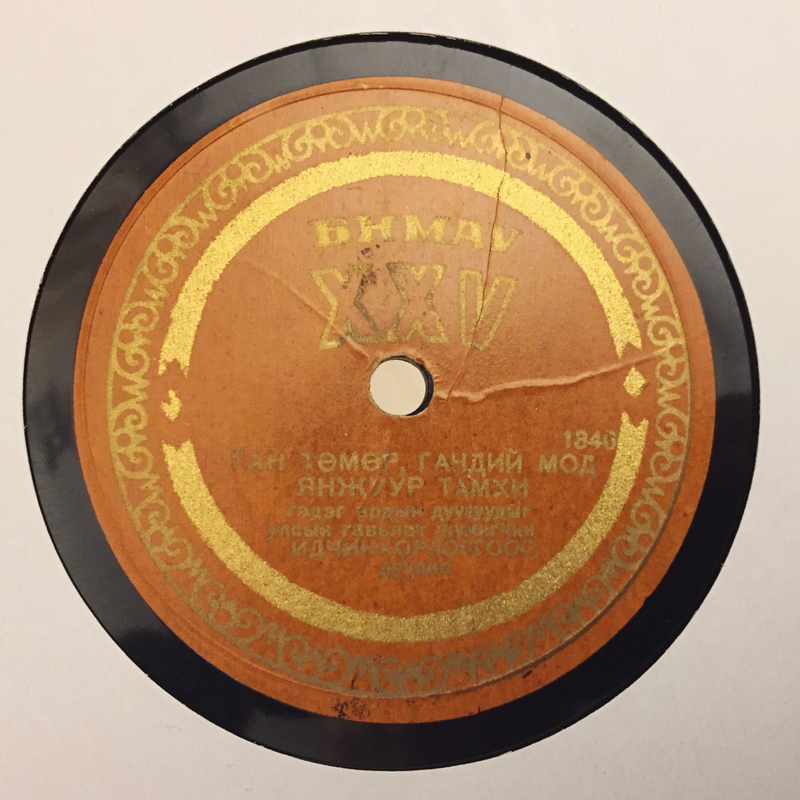 It was likely recorded in Tbilisi, as the flip side is from the same sessions and features a kemanche (violin) solo by Sasha Oganezashvili (1889-1932). Oganezashvili, a Georgian who was also known as Alexander Ohanyan Arshak, had actually recorded with Bala Melikyan’s father in 1909, for the Gramophone Company. Melikyan died in 1935. This disc was issued first on the MuzTrust label, then reissued a few years later on the SovSong label. 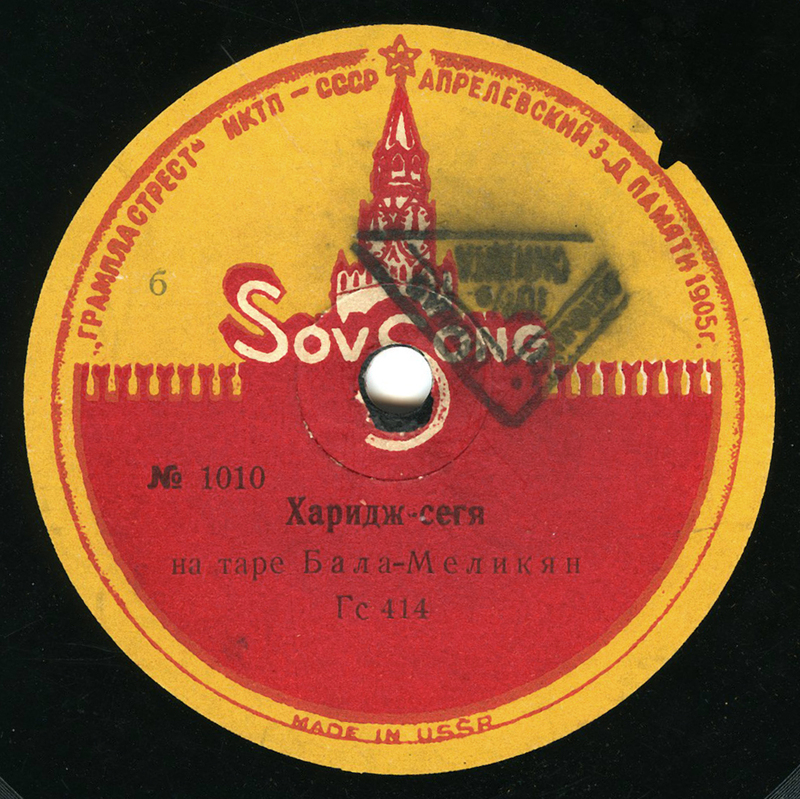 SovSong was pressed by the Aprelevka pressing plant – long before the famous and well-distributed Aprelevsky Zavod imprint of the giant Soviet recording apparatus. *This seems to hold true. There were, however, Georgian, Armenian, and Azeri songs pressed on 78 on the Muzpred label in the mid-1920s, all performed by a man named Armenak Kahurov. It may be very likely, however, that these were all recorded in Russia. 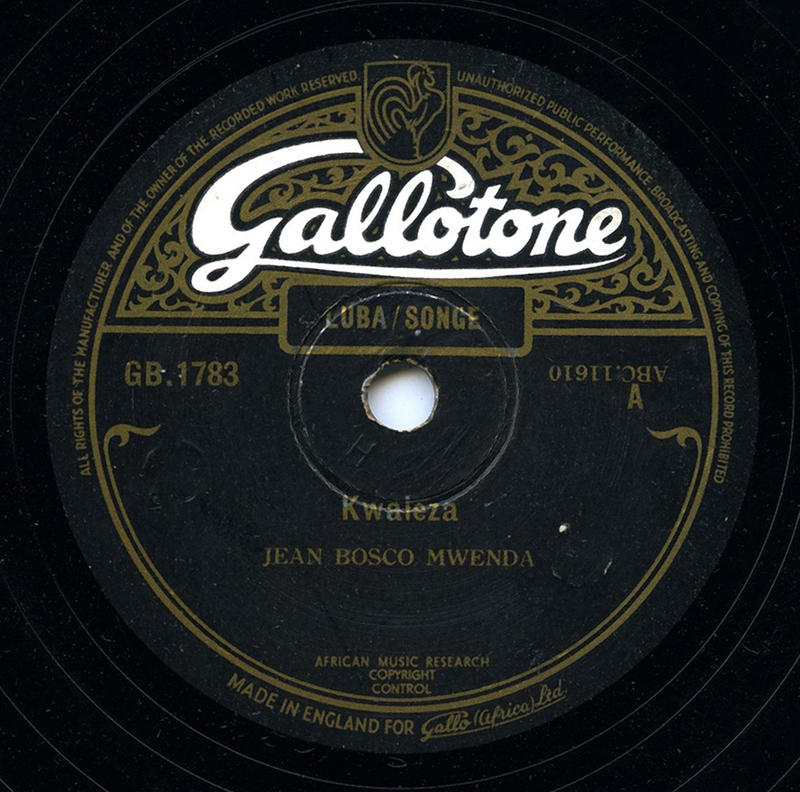 If there is one Sub-Saharan African acoustic guitarist from the “golden era” of African guitar playing that people in the West may have heard of, it’s probably Jean Bosco Mwenda (or Mwenda Jean Bosco, as is the standard). This, despite the fact that very little of his output has ever been reissued, and all of his discs are very rare. His reputation outside of Congo and East Africa largely stems from just one of his compositions: “Masanga,” a beautifully executed, inventive, musically varied piece that originally appeared on 78 in 1952. Bosco was born in 1930. Hugh Tracey, the South African ethnographer who was a part-time recordist and scout for the Gallotone label at the time, heard Bosco playing on the streets of Likasi, Congo (then known as Jadotville) in 1951, and cut his first records for that label. “Masanga” was so popular locally that there were two versions of it issued on 78 within one year – one with vocals and an instrumental. Bosco’s career as a musician was launched, though he still continued his work at a bank, and later for a mining company. His first records were usually sung in his native Sanga language (a branch of Luba)1, although as his popularity grew he very often sang in Swahili. Bosco continued to record for Gallotone without Hugh Tracey, and later for the Kenyan ASL label in 1962, possibly when he had re-located to Nairobi for a six-month stint advertising an aspirin product known as Aspro, with his cousin, guitarist Edouard Masengo (one promotional Aspro 78 has been discovered, by Masengo). It’s estimated that Bosco recorded at least 100 78s in total, though there is no complete discography of his works, no catalog, nor documentation that broadly discusses his output. Anyway – after 1952, Tracey regularly extolled Bosco and featured “Masanga” in his lectures to African music and culture societies around the globe, to great response, even directly selling copies of the Gallotone 78 to members of his audience. Tracey had formed the International Library of African Music (ILAM) and had begun his “Music of Africa” series of 10″ LPs, culled from his tapes. These LPs were for Western audiences – really, the first extensive, contemporary retrospective of African popular and traditional music – and Tracey included a version of “Masanga” on the “Guitars of Africa” volume…except, it was totally uncredited. “Masanga” did receive an Osborn Award from the African Music Society. As early as 1961, ethnomusicologist David Rycroft penned two articles on Bosco’s guitar technique for the journal African Music, focusing in part on “Masanga.” Rycroft mentioned that “somehow” Bosco had learned guitar finger picking, a statement that may indicate how little of this music was available in the West, as not only were there numerous acoustic guitar players active on disc when Bosco was discovered, but by 1961, when Rycroft was writing, there were probably hundreds of acoustic guitarists in Congo, Eastern, and Southern Africa on 78s at that time, many of whom were terrifically talented finger-pickers. It also shows that scholars in the West didn’t necessarily understand the record industry at the time, as Sub-Saharan Africans in urban areas had long been given the chance to hear American guitar-based country music and other styles (like Caribbean music), on imported 78s. Frank Crumit, the balladeer of the ’20s and ’30s, was quite popular in Kenya, for example. This is not a knock on Rycroft or Bosco’s obvious talent – it’s just a statement that we can make in hindsight, now knowing a broader picture. The availability of this music is only slightly better than it was in 1961. In order to hear most of the music that was issued on 78 around the globe, you have to track down the original copies. This is a lifelong quest. Bosco’s output appears to have stopped entirely after 1962, a writer later stating that his career fell into oblivion once guitars went electric on most African record labels. However, Bosco was invited to the Newport Folk Festival in 1969. This was his only trip to the U.S. In 1982, after several years trying to locate Bosco, Austrian ethnomusicologist Gerhard Kubik along with guitarist John Low, helped to bring Bosco to Europe for a brief tour organized by the Iwaleza House in Bayreuth, and to record an album. Later, musician, author, and historian Elijah Wald studied with both Bosco and Masengo in the late 1980s, learning their technique and songs, and for years was the only person offering a sample of Mwenda’s rare discs on homemade CDs. I mention all of this, because even though Bosco’s records were essentially distributed only in Africa, and apart from “Masanga” his works were virtually out of reach to anyone else, there had been several concerted efforts by determined scholars and musicians to bring his music to a wider audience prior to Bosco’s death in 1990. Most recently, the vocal version 78 of “Masanga” was included on the Secret Museum of Mankind series on Yazoo, a tape-original was issued on The Very Best of Hugh Tracey on SWP Records, and I included the instrumental version on Opika Pende. I first heard a copy of this song “Kwaleza,” about 12 years ago, on a homemade CD made by longtime blues and country 78s dealer and musician, the late Mike Stewart (aka Backwards Sam Firk). It’s no surprise that Stewart, a veteran cohort of John Fahey and Joe Bussard, would become enamored of this music. While not nearly as ingenious as “Masanga” (what could be?) – in fact, it’s far more simple – it became one of my favorite pieces, with its repetitive melody. I never thought I’d ever get my own copy. I never knew anyone else who had it. It wasn’t for lack of trying…or even relentless drive. Sometimes, it just takes time, luck, and friends. It was winter in the South Caucasus, and an American recording engineer in his mid-20s named William Sinkler Darby was on the road. Darby was already a pioneer in that fledgling industry, having worked in Emile Berliner’s studio in Washington, DC, in the mid-1890s. After arriving in London in 1899 to meet his former colleague at Berliner, Fred Gaisberg, and to help establish the soon-to-be massive Gramophone Company, Darby would begin an itinerant lifestyle that would take him across multiple continents in just a few years – rarely, it seems, with the time to look back. The market for sound recordings was beginning to explode. He began traveling long distances by rail as Gaisberg’s steadfast companion and assistant, demonstrating the new gramophone and recording artists across Europe. Within a short time, they’d recorded in Leipzig, Budapest, Vienna, Milan, Paris, Madrid, Valencia, Glasgow, Belfast, and Cardiff. By 1901, Darby started to lead recording expeditions on his own, bringing him again to Germany, the Netherlands, Poland, and Moscow, recording hundreds of sides. By February of 1902, Darby had already recorded in St Petersburg multiple times, learning how to deal with extreme cold and the temperament of Feodor Chaliapin. One wonders if Darby felt the same. Likely the music was baffling to these engineers from America. Up to that time, the normal recording repertoire for the Gramophone Company was what one might expect. It primarily consisted of Western classical vocalists and instrumentalists, comic singers, military bands, and other entertainers. A substantial amount of European folk music had certainly been recorded by that time – in Spain, for example – but Asia was a different story. In 1902, even Cairo had not yet been visited and captured on disc. This was an industry in transition in more ways than one; improving rapidly in terms of technology, yet still in its earliest stages, recording anything, expanding markets. The Gramophone Company’s records at that time were one-sided, and pressed in the company’s plant in Hanover, Germany. The reverse sides of these discs were etched with the image of a cherub cutting grooves into a record with the quill of a feather. In 1901, a 10″ disc that held 3 minutes of recording was perfected and put into use – but the 7″ disc was still commonly used as a primary sound carrier on these excursions, and at the home office in London…even if it sometimes held far less than two minutes of music. Despite the vast expanse of mountainous, rural terrain to cross, there were important, multicultural urban centers in the Caucasus, and Darby was sent to explore them on this brief trip, presumably to investigate if business was viable. And by doing so, he accidentally made history. His two stops were Baku, in present day Azerbaijan, and Tbilisi, in Georgia. It’s likely that he took the Transcaucasus Railway, which by the early 1880s reached both cities. In any case, Darby arrived in Baku at 2 AM, February 6th, 1902. He spent only two days in the city, though he managed to record 57 discs’ worth of material – mostly brief, 7″ masters. Azeri music was labeled “Persian Tatar” when Darby’s recordings hit the shops, but he also recorded a number of Armenian artists. 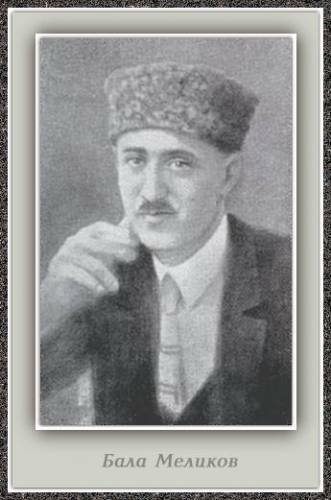 He recorded several sazandar, the trios associated with Azeri mugham music, as well as instrumental soloists, a poet, and folk dances. Darby spent a total of 9 days in Tbilisi, and what we know of the recordings he made there again show the musical diversity of the region. He recorded the first Georgian polyphonic choirs, violin and tar improvisations, a host of Armenian and Georgian singers, double reed duets of duduk and zurna, even soloists on the wooden salamuri flute and the tárogató reed. There were songs from the Georgian regions of Guria, Kakheti, and Kartli. All told, he recorded 117 records, more than two-thirds of which were one-sided 7″ releases. Only 31 were longer performances on 10″ masters, of which this example is one. Where were these discs sold? 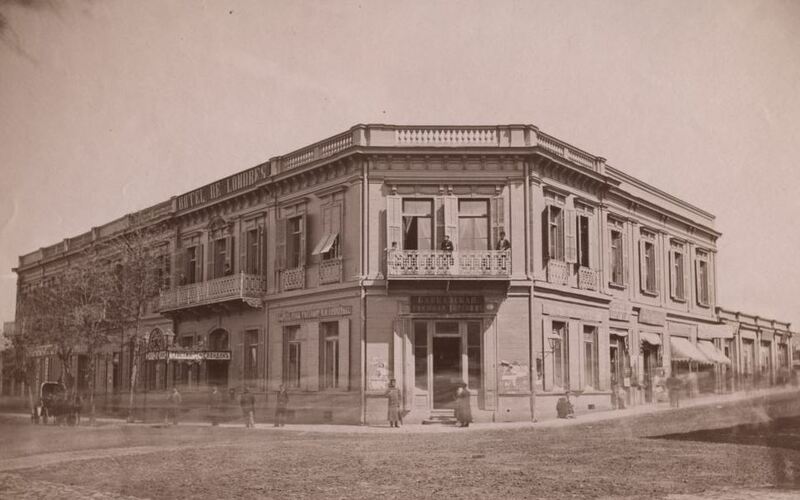 According to Anzor Erkomaishvili of the Rustavi Choir, the Gramophone studio shop in Tbilisi was in operation from 1901 to 1914, and at least for a time run by G.S. Davidov. It was located on the main street of Tbilisi – what was then called Golovinsky Prospect and now known as Rustaveli Avenue. This appears to have been the only recording from those sessions featuring music from the region of Abkhazia. An instrumental featuring two double-reed zurnas and percussion. (I thought, perhaps, that they might be playing the Abkhaz reed, the abyk, but I don’t think so – at the same session two zurna players are listed performing some duets with duduk, so it is very likely those are the same performers.) 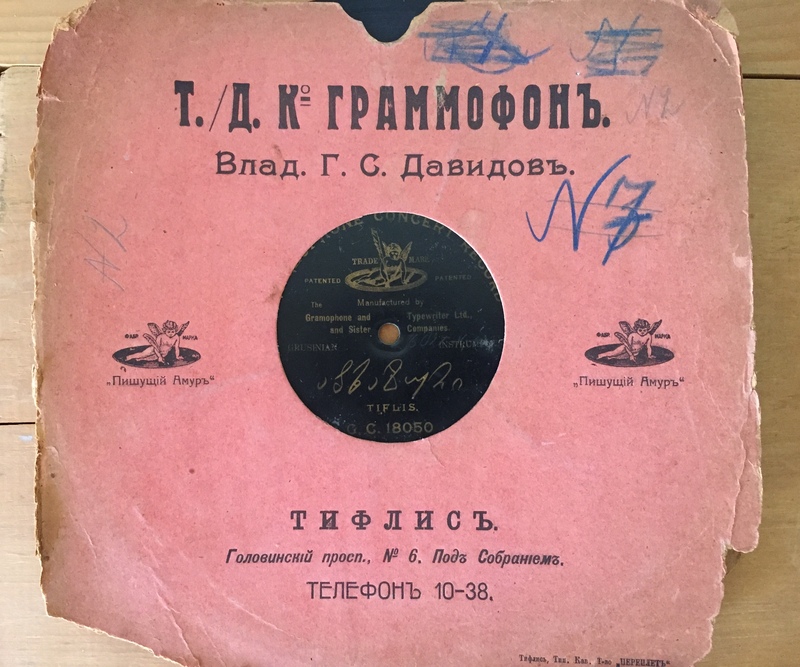 The label of the disc itself says only one thing in Georgian handwriting: “Abkhazuri” along with “Grusinian” in English, which was the old adjectival form for “Georgian.” No performers are credited, though we do have some additional notes that exist in the original ledgers – the term “Kabardinskiy Tanetz” was listed. This indicates that it’s a dance tune from northwest of Abkhazia, in the region known as Kabardinia, now part of the Russian republic of Kabardino-Balkaria. Whether or not these are Abkhaz musicians, we’ll probably never know. 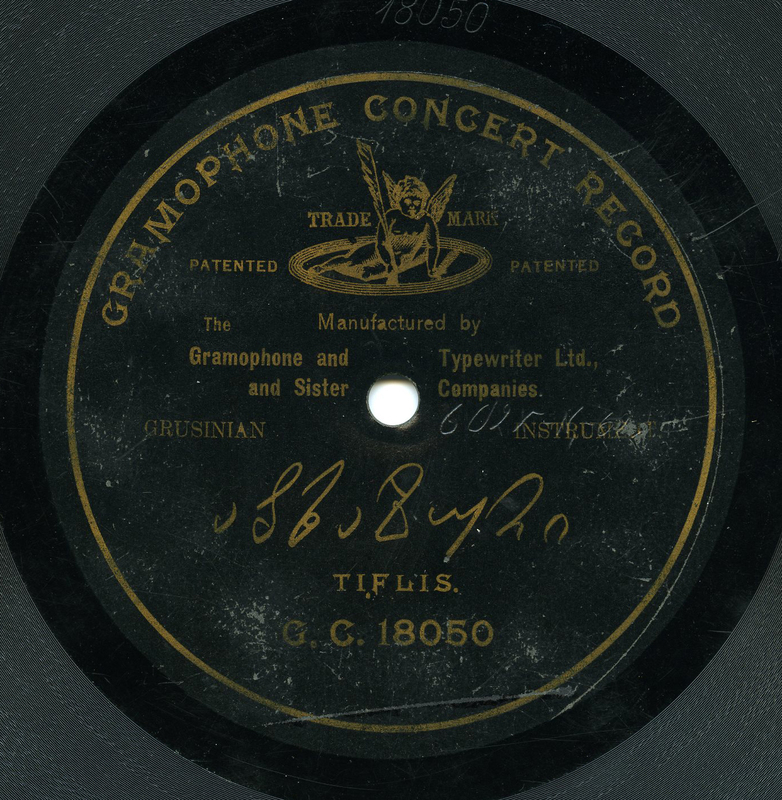 The Gramophone Company must have found some success in these sessions, as they sent engineers Franz and Max Hampe back to Tbilisi several times between 1903 and 1907. In 1909, Franz Hampe recorded in the city on his massive Central Asian tour so well-documented in Will Prentice’s Before the Revolution CD on Topic, as well as the Drinking Horns and Gramophones CD on Traditional Crossroads – both essential CDs and primary references. One year later, engineer Edmund Pearse recorded a host of sides in Tbilisi every year from 1910 to 1914. Then, the Great War, and the Russian Revolution. Over the past 27 years, since Georgia declared its sovereignty, Abkhazia has been the site of strife, accusations of ethnic cleansing, and war between Russia and Georgia. The Abkhaz consider themselves a Russian republic, though they are recognized by just a few international entities. Georgia considers it an autonomous republic of Georgia. The Hotel London, as it stands today, is a shadow of its formal self. It’s now a private apartment building in a state of arrested decay. I went past just two weeks ago. 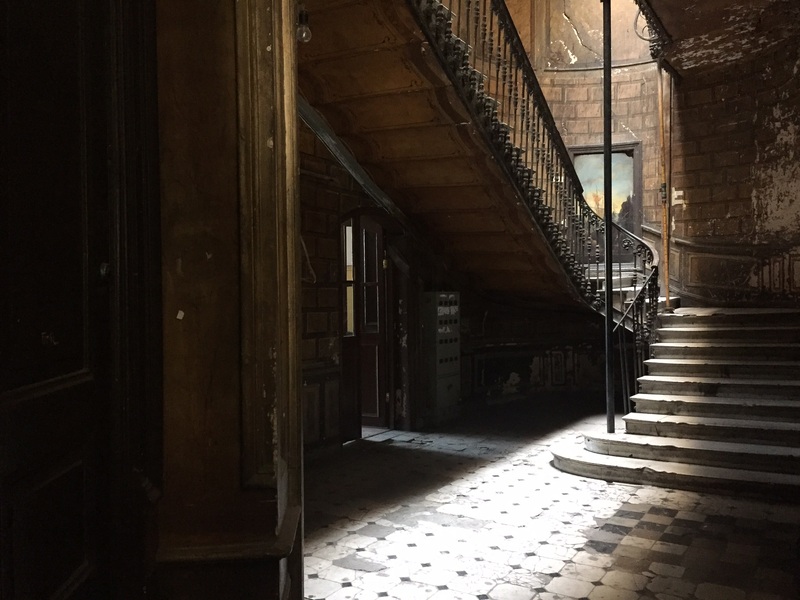 Its front entrance has been replaced, but peek inside the side entrance and you might be able to imagine the sounds coming out of one of the rooms that February, 115 years ago. 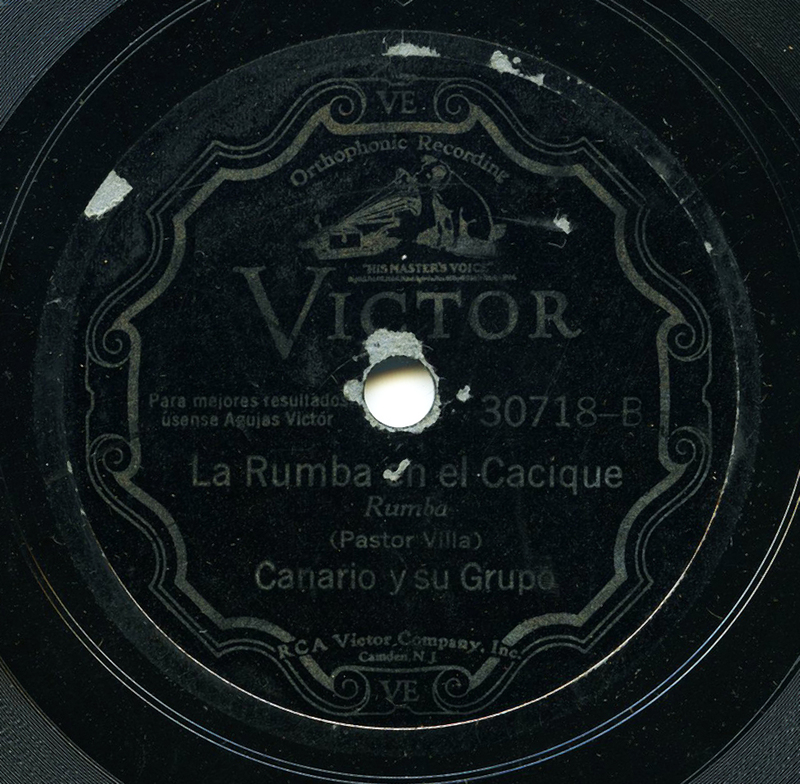 One of the reasons I hadn’t yet posted an early Puerto Rican track is, first, that it’s quite difficult to find pre-1935 78s from Puerto Rico in playable condition. Many are exceptionally rare. And second, there have been some top shelf reissue collections already produced – namely the Los Jardineros compilation on Yazoo, and Lamento Borincano on Arhoolie – it’s hard to augment what’s already outstanding. However, when I heard this 1932 recording by one of the great groups of the day, which had not been reissued, I thought it might be a nice addition to the fold. Manuel Jiménez was born in 1895 in central Puerto Rico, in the town of Orocovis. By the age of 10, he was already working in a sugar mill. According to several biographies, he stowed away on a ship as a teenager and effectively became a merchant seaman, bringing him first to Barcelona and then eventually to New York City in the late 19-teens. At some point during his early years, he was given the nickname that would stick with him for his life: El Canario (“Canary”). Confirming Canario’s early activities in New York will run you into contradictions. According to several sources, Canario first recorded for Pathé as early as 1914, and for Odeon in 1915 or 1916. However, these were apparently Mexican corridos. I could find no confirmation or identification as to what these recordings were. 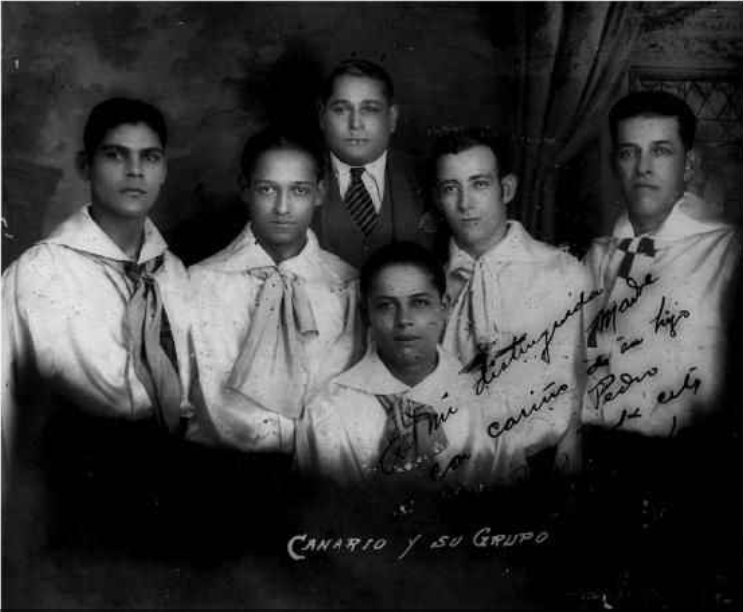 Also, additional sources state that Canario was part of Rafael Hernández’s famed Trío Borinquen in 1926 during their first session, although discographers do not include his name as a member of the band. What can be confirmed is that, according to interviews with Canario, those early years were pretty destitute for new Puerto Rican arrivals. Ewin Martínez Torre wrote that Rafael Hernández was known to busk around Brooklyn in the 1920s, possibly for mere food. Apparently things changed in the late 1920s, when larger audiences and venues became available to New York’s Puerto Rican musicians. Canario launched his lengthy and successful tenure with the Victor company in April of 1929, where he would solidify his reputation as one of the great Puerto Rican bandleaders. He branched out and began playing for other labels in 1932, first briefly for Brunswick, and then for Columbia through the late 1930s, continuing his success. Canario is known today for introducing the plena to New York’s Puerto Rican record-buying public, and his reputation still rests on that. The plena is a musical style with African influences linked to the coastal, southern regions of Puerto Rico, and which developed in the sugar plantations. Canario’s first recorded tunes were plenas, but scholar Ruth Glasser documents that this may have been more of a canny marketing move for Canario, as he may not have been particularly familiar with the genre long prior to that time, but recognized its commercial potential. Canario was a vocalist but not technically a musician, either. He was known as being a generous group leader, with his group touring regularly, rotating top musicians in and out of its various iterations. With that in mind, it’s not surprising that Canario, throughout his 80+ sides for Victor, also recorded plenty of boleros, guarachas, “seis corridos,” Christmastime aguinaldos, and even a few rumbas, like this one, recorded April 13, 1932, accompanied by two guitars, trumpet, percussion, and vocalist Fausto Delgado. The songwriter, Pastor Villa, played with Canario as well as the Trío Boricua, Grupo Antillano for Brunswick, the Grupo San Juan, and the Grupo Victoria. He is remembered as a colorful personality who was later involved in the numbers racket, according to his relatives. Canario died in 1975, and Villa in 1959 or 1960. Image courtesy of the Center of Puerto Rican Studies, Hunter College, New York. Canario is in the rear, center. When people in the West hear “Okinawa,” their thoughts probably start and stop with America’s military. During the Asia-Pacific War including the Battle of Okinawa, nearly 150,000 non-military Okinawan civilians died. After the post-World War II occupation of Japan, the U.S. continued to stake claim over Okinawa until 1972. Once they relinquished control to Japan, they’ve continued to operate a total of 32 military bases on the 70-mile-long island. Okinawans continue to protest, and many want the complete removal of the American military. Many also want complete independence from Japan, as well. Okinawa isn’t just a victim of international geopolitics…nor is it just one island. It’s one puzzle piece in the fascinating history of the Ryukyu or Nansei archipelago – a unique part of the world, with its own thriving indigenous culture. Situated between Taiwan and Japan are the 55 islands that were once the Ryukyu Kingdom, which played an important role in maritime trade for centuries, between Southeast Asia, China, and Japan. Once a tributary kingdom of China during the Ming dynasty, then a tributary kingdom of Japan, the Ryukyu Kingdom continued all the way to the late 19th century, when the 1,100+ square mile area it encompassed was usurped into Japan. The islands have been occupied for perhaps as far back as 32,000 years, and the native Ryukyuans, or Uchinaanchu, have their own languages which are more than just dialects, and are in fact unintelligible to Japanese speakers. Their folk music, at least to my underexposed ears, feels situated just as its geography – somewhere between Japan, China, and Southeast Asia. It’s got a separate feel entirely from the geisha songs with samisen from Japan, often has a driving rhythm, and is deeply rooted in local folk traditions. The main instruments that you’ll hear on this piece are the snake skin covered, three-stringed Okinawan lute, the sanshin, which is similar and perhaps a precursor to the samisen in Japan; at least one taiko drum is heard, as well as the clacking sound of the yotsutake, which are handheld pieces of bamboo that are clapped together to the beat of the rhythm. When I found this disc, it had the word “Fisherman” carved into the label by a previous owner. I knew it had to be good. This is a seamless medley of two folk songs performed by the “Princesses of Okinawa Music,” Itokazu Kame (1915-1991), and Hunakoshi Kiyo (1914-1998). Itokazu Kame provides the main vocal throughout, and Hunakoshi Kiyo plays the sanshin and sings backup. Teruya Rinsuke plays the taiko drum(s), and Maekawa Choushou plays the mandolin. The first piece, “Tancha-me-Bushi,” is a song about the Tancha-me Beach, near the town of Onna, on the main island of Okinawa. This is a well-known melody from the region – a song about the annual harvest of sururu fish on the beach, and how local fisherman are proud of their daughters selling sururu on the streets. The second piece, “Katsuren-Bushi,” is about the beauty of the women on the Katsuren Peninsula, and how fishermen from other islands pine for them – but the unpredictable currents and tides around the peninsula make the journey too risky, so they can only yearn. This is another example of how commercial 78s were everywhere, even in what might be considered to be rural, hard to reach communities. This was the case of a smaller, local record company providing Okinawan music for both Okinawans, and the Okinawan diaspora. 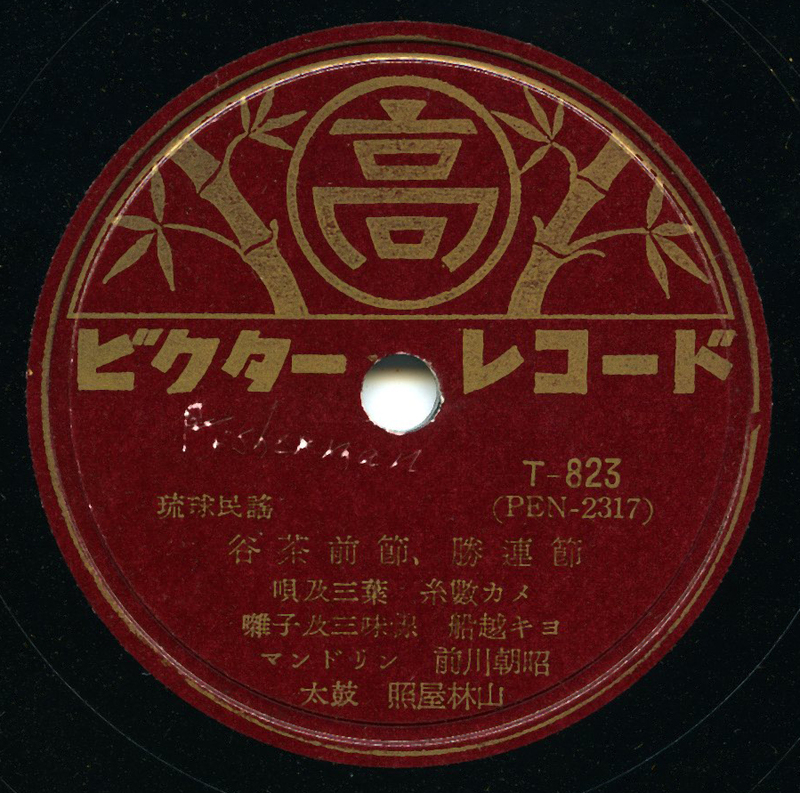 Okinawan or Ryukyuan folk music performed by actual Okinawan musicians seems to have been only occasionally recorded during the 78rpm era, until after the Second World War. The first label that was active was named Marufuku, and was established in 1927 in Osaka, a city which at the time held a large amount of Okinawan immigrants. The Tahei label, active as a Japanese imprint since 1930 or so, issued some Okinawan material after 1950, and two local independent labels cropped up, including Marutaka. This piece is on Marutaka from ca. mid-1957. Marutaka was established in 1955 by an Okinawan businessman named Koura Jiro, and Jira Takara, who owned the Takara Watch Store on Helwa Street in Naha City in Okinawa. It was, at least at first, a subsidiary of Victor in Japan, who pressed the records. Many thanks to JiHoon Suk for detailed information and translation, Kato David Hopkins, and to Izumi Kinoshita for introducing me to this music.